Peter Barratt gives a stirring and passionate account of his great-grandmother's hard-fought campaign for the right to vote over a 100 years ago. 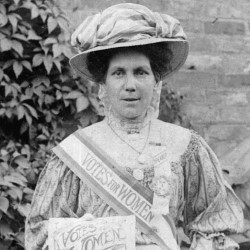 A shoe machinist by trade, lifelong socialist and mother of six, Alice Hawkins formed her city suffragette branch in 1907 following imprisonment in Holloway jail. Centenary year of 2018 marked a statue of Alice in her home town of Leicester together with original suffragette memorabilia exhibited at UK Parliament, including her sash, hunger strike medal and more. Sister suffragette Ruth Pownall adds true theatre to an unmissable spoken word show.